Ernest Taylor Pyle (August 3, 1900 – April 18, 1945) was an American journalist who wrote as a roving correspondent for the Scripps Howard newspaper chain from 1935 until his death in combat during World War II. His articles, about the out-of-the-way places he visited and the people who lived there, were written in a folksy style much like a personal letter to a friend. He enjoyed a loyal following in as many as 300 newspapers. Ernie Pyle's body lay alone for a long time in the ditch at the side of the road. Men waited at a safe distance, looking for a chance to pull the body away. But the machine gunner, still hidden in the coral ridge, sprayed the area whenever anyone moved. The sun climbed high over the little Pacific island. Finally, after four hours, a combat photographer crawled out along the road, pushing his heavy Speed Graphic camera ahead of him. Reaching the body, he held up the camera and snapped the shutter. The lens captured a face at rest. The only sign of violence was a thin stream of blood running down the left cheek. Otherwise he might have been sleeping. His appearance was what people in the 1930s and '40s called "common." He had often been described as the quintessential "little guy," but he was not unusually short. In fact, at five feet eight inches, his frame precisely matched the average height of the millions of American soldiers serving in the U.S. Army. It was his build that provoked constant references to his size -- a build that once was compared accurately to the shape of a sword. His silver identification bracelet, inscribed "Ernie Pyle, War Correspondent," could have fit the wrist of a child. The face too was very thin, with skin "the color and texture of sand." Under the combat helmet, a wrinkled forehead sloped into a long, bald skull fringed by sandy-red hair gone gray. The nose dipped low. The teeth went off at odd angles. Upon meeting Pyle a few months earlier, the playwright Arthur Miller had thought "he might have been the nightwatchman at a deserted track crossing." In death his hands were crossed at the waist, still holding the cloth fatigue cap he had worn through battles in North Africa, Italy, France, and now here in the far western Pacific, a few hundred miles from Japan. 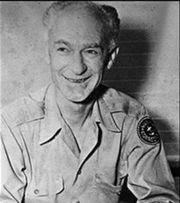 COMMAND POST, IE SHIMA April 18, (AP) -- Ernie Pyle, war correspondent beloved by his co-workers, G.I.s and generals alike, was killed by a Japanese machine-gun bullet through his left temple this morning. The bulletin went via radio to a ship nearby, then to the United States and on to Europe. Radio picked it up. Reporters rushed to gather comment. In Germany General Omar Bradley heard the news and could not speak. In Italy General Mark Clark said, "He helped our soldiers to victory." Bill Mauldin, the young soldier-cartoonist whose warworn G.I. 's matched the pictures Pyle had drawn with words, said, "The only difference between Ernie's death and that of any other good guy is that the other guy is mourned by his company. Ernie is mourned by the Army." At the White House, still in mourning only six days after the death of Franklin Roosevelt, President Harry Truman said, "The nation is quickly saddened again by the death of Ernie Pyle." One of Pyle's editors at the Scripps-Howard newspapers, George Parker, spoke on the radio. "He went into war as a newspaper correspondent among many correspondents," Parker said. "He came back a figure as great as the greatest -- as Eisenhower or MacArthur or Nimitz." Parker spoke of "that strange and almost inexplainably intimate way" in which Pyle's readers had known him. Indeed, people called newspaper offices all day to be sure Ernie Pyle was really dead. He had seemed so alive to them. Americans in great numbers had shared his life all through the war -- his energy and exhaustion; his giddy enjoyments and attacks of nerves; his exhilarations and fears. Through Pyle's eyes they had watched their "boys" go to distant wars and become soldiers -- green and eager at the start, haggard and worn at the end. Through his eyes they had glimpsed great vistas of battle at sea and they had stared into the faces of men in a French field who thought they were about to die. So no one thought it strange for President Truman to equate the deaths of Franklin Roosevelt and a newspaper reporter. For Pyle had become far more than an ordinary reporter, more even than the most popular journalist of his generation. He was America's eyewitness to the twentieth century's supreme ordeal. The job of sorting and shipping Pyle's personal effects fell to Edwin Waltz, a personable and efficient Navy man who had been working as the correspondent's personal secretary at Pacific Fleet headquarters at Guam. There wasn't much to go through -- a few clothes and toilet articles; books; receipts; some snapshots and letters. Here was Pyle's passport, stamped with the names of places he had passed through on his journeys to war -- Belfast and London; Casablanca and Algiers; and on the last page, "Pacific Area." Waltz also found a little pocket notebook filled with cryptic jottings in a curlecue script -- notes Pyle had made during his last weeks in France in 1944. Blowing holes to bury cows -- stench everywhere. Waltz also found a handwritten draft of a newspaper column. Knowing the war in Europe could end any day, Pyle had collected his thoughts on two sheets of paper, then marked up the sentences with arrows and crossings out and rewordings. "And so it is over," the draft began. "The catastrophe on one side of the world has run its course. The day that had so long seemed would never come has come at last." He was writing this in waters near Japan, he said, "but my heart is still in Europe...For the companionship of two and a half years of death and misery is a spouse that tolerates no divorce." He hoped Americans would celebrate the victory in Europe with a sense of relief rather than elation, for in the joyousness of high spirits it is easy for us to forget the dead. ...there are so many of the living who have burned into their brains forever the unnatural sight of cold dead men scattered over the hillsides and in the ditches along the high rows of hedge throughout the world. Dead men by mass production -- in one country after another -- month after month and year after year. Dead men in winter and dead men in summer. Dead men in such familiar promiscuity that they become monotonous. Dead men in such monstrous infinity that you come almost to hate them. Those are the things that you at home need not even try to understand. To you at home they are columns of figures, or he is a near one who went away and just didn't come back. You didn't see him lying so grotesque and pasty beside the gravel road in France. We saw him. Saw him by the multiple thousands. That's the difference. For unknown reasons Scripps-Howard's editors chose not to release the column draft, though V-E Day followed Ernie's death by just three weeks. Perhaps they guessed it would have puzzled his readers, even hurt them. Certainly it was a darker valedictory than they would have expected from him. The war had been a harsh mistress to Ernie. First it had offered him the means of escaping personal despair. Then, while his star rose to public heights he had never imagined, the war had slowly driven him downward again into "flat black depression." But he kept this mostly to himself. Instead he had offered readers a way of seeing the war that skirted despair and stopped short of horror. His published version of World War II had become the nation's version. And if Ernie Pyle himself had not won the war, America's mental picture of the soldiers who had won it was largely Pyle's creation. He and his grimy G.I's, frightened but enduring, had become the heroic symbols of what the soldiers and their children would remember as "the Good War." "Death Photo of War Reporter Pyle Found"
"The Death of Captain Waskow," by Ernie Pyle (one of his most famous and reprinted columns). "Death Photo of WWII Icon Ernie Pyle Surfaces."